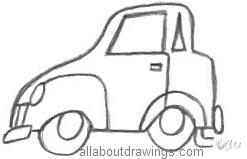 Let's experiment and convert different car models into cartoon drawings of cars. When I started learning how to draw, I had no clue how to animate anything, let alone know how to transform a real car into a cartoon. As it turns out, I discovered if you let yourself learn little bits about how to draw as you go along, eventually it all falls into a place of understanding and it is not as hard as you first thought. I try to keep my outlines very simple because I'm aware of my capabilities of what is possible at this early stage. It is a fantastic feeling when you see something resembling a car appear on your paper like magic. This is easy and you must try it! 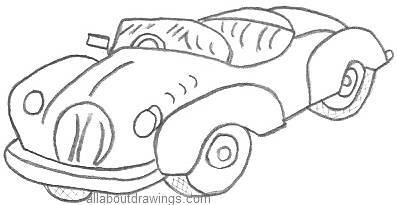 To make some funny cartoon drawings of cars, copy an outline and squish it up with some well placed lines. There is no need to worry about proportion - in fact, the less you know about proportion and perspective, the better. Exaggeration is the key to drawing cartoons successfully. That very fact reveals that this is an excellent subject for beginner artists because our knowledge about the subject is very limited. There is a certain kind of power that you feel when you actually create a cartoon on paper - take particular notice, it is you who is creating! You who never dreamed you could draw, let alone design an original, but look at you now! 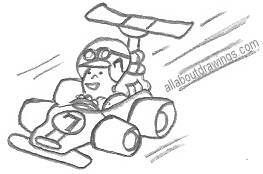 In the windscreen space, think about whether you would like to draw a face, with an exaggerated nose and a mouth. This drawing is clearly out of proportion, but... it's a cartoon! Who cares? Just scribble some marks outside the car to indicate whether it is braking or speeding, again, you feel kinda good just adding these little effects to a drawing. Cartoons create humor by overstatement and understatement and their main function is to entertain. These cartoon cars don't resemble any car on the market today - there would definitely be something wrong with my illustration if a particular model is identified. My next drawing is my version of a sporty model. It looks a bit like one out of the comics - maybe Mickey Mouse owned a car like this at some stage. It's not as easy to draw as the ones above (as you can see by my feeble first attempt) but you might like to take up the challenge and have a go at copying it. 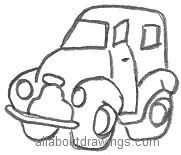 Cartoon drawings of cars are similar to fantasy drawings because it doesn't matter how you draw them - there is no right or wrong way... yay for cartoons! If you really want to draw, now is a very good time to start and you won't regret it! By placing one foot in front of the other, your life becomes more creative with each step. As I've said before, you'll never know if you don't have a go. If you feel a slight interest in learning how to draw, cartoons are especially made for beginners.